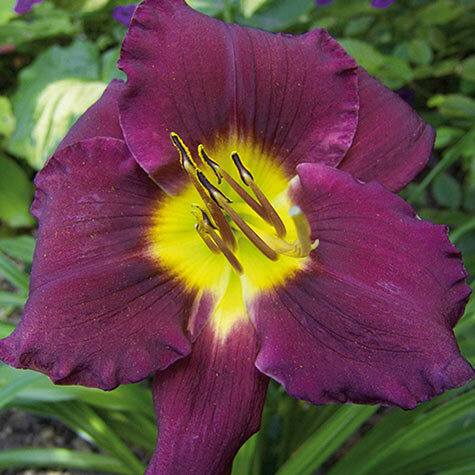 Bella Lugosi Daylily | Gurney's Seed & Nursery Co. Features deep purple, 6-in. flowers with lime green throats. Its brilliant color does not fade in the sun. Grows 32-34 in. tall. Blooms in midsummer. Bareroot. Zones 3-9. Color: Deep purple-red with lime-green throat. Blooms: Mid Summer; 1 day/flower, plant flowers for weeks. Flower Form: 6 inch saturated true purple flowers with a lime-green throat. Soil Requirements: Average, well-drained soil. Will grow in any soil from normal to slightly wet to dry. Pruning: Remove wilted flowers regularly for increased flower production. Comments: Daylilies belong to the Lily family, but are not true Lilies. This variety grows compact and is decorative and strong. Every day the plant develops a lot of new very beautiful scarlet red flowers, very open, showing large contrasting yellow-green throat all Summer long. Suitable for growing in sunny shade flowerbed and in containers year after year.